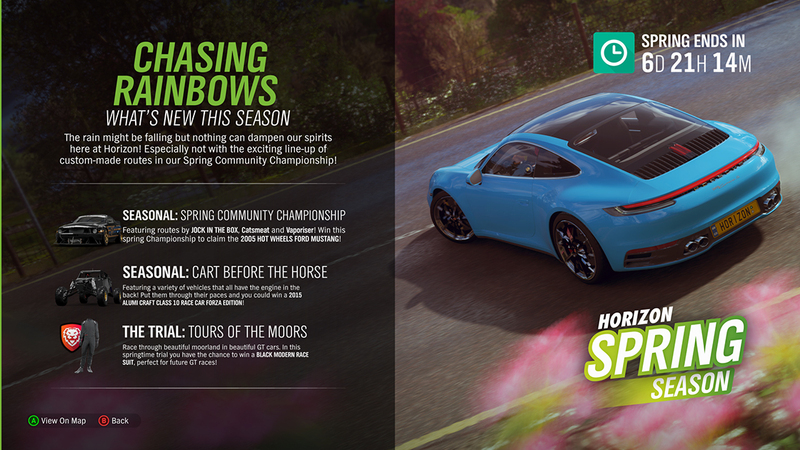 Spring has sprung once again in Horizon, and just as with spring cleaning, there is much to do. First off on the mainland you can hit the Spring Community Championship with fun routes from Jock in the Box, Catsmeat, and Vaporiser. Way to go Vaporiser for being featured two-weeks in a row! Win the Championship to get your hands on the 2005 Hot Wheels Ford Mustang. Going against standard practice, as many great engineers do, take on the “Cart Before the Horse” seasonal series. Vokswagen and Porsche fans (among others) will love these events focused on cars with the engine in the back. 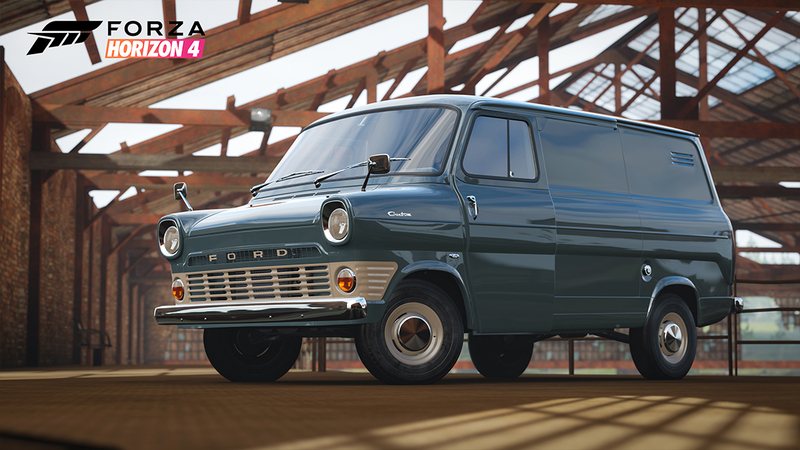 Win here and you get the 2015 Alumi Craft Class 10 Race Car Forza Edition. Then hop in your favorite GT car and go to The Trial: Tour of the Woods. Reach your goal in time to earn the Black Modern Race Suit. 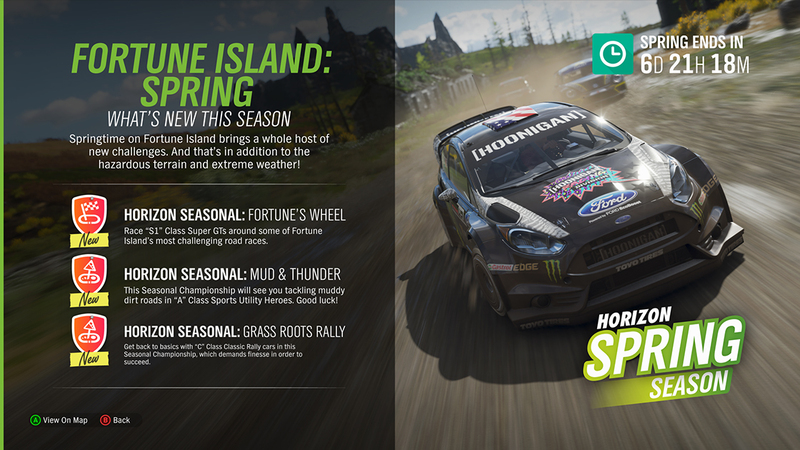 Over on Fortune Island you have the Horizon Seasonal: Fortunes Wheel event pitting S1 Class Super GT cars against one another on challenging courses. Or there is Mud & Thunder for A Class Sports Utility Heroes. Feeling rally inspired? Take on the Grass Roots Rally in basic C Class rally cars. What can you earn? Win the events and find out! Get to know the 1995 Mitsubishi Eclipse GSX in the Weekly Challenge in these tough events. Complete them all for 200 #Forzathon Points. If you haven’t already, go pick up your free 1995 Mitsubishi Eclipse GSX and drive it somewhere. Done. Win six street events in your Eclipse. Finish this sentence and complete the challenge by winning five drag race events in the Eclipse. Style is everything. 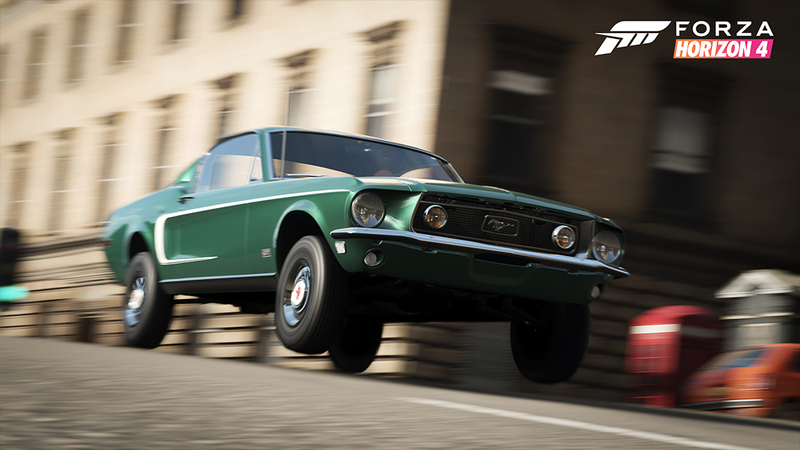 Show your fellow racers what you got for them by drifting as you pass them to earn five Show-Off Skills. There’s nothing like a spring thaw to inspire some new looks with these stylin’ and Legendary items. 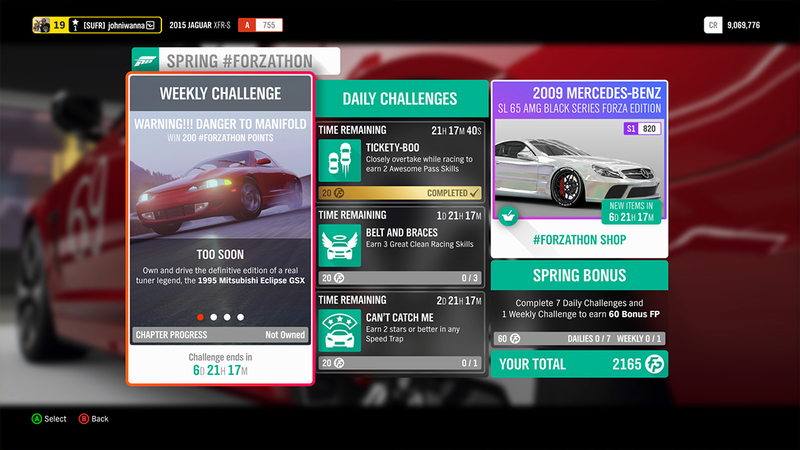 First off spend, spend, spend to get the 2009 Mercedes-Benz SL 65 AMG Black Series Forza Edition. 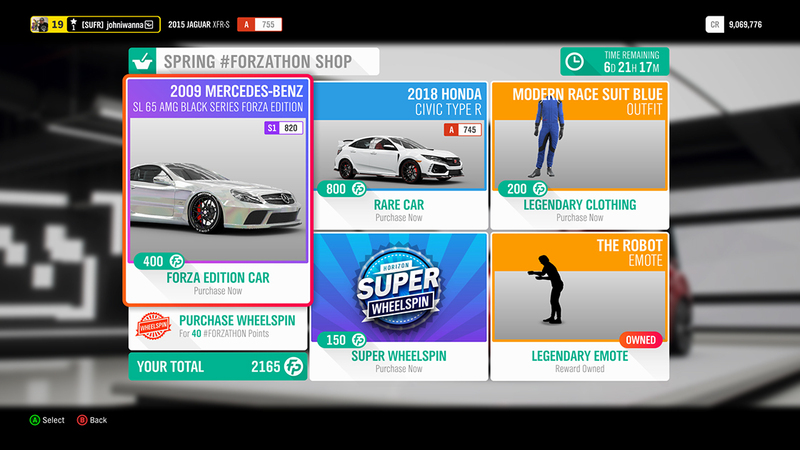 It’s on offer for 400 #Forzathon Points. Or pick up the 2018 Honda Civic Type R if big wings and front-wheel-drive are your thing. It’ll cost you 800 FP though. Feeling blue? Get a racing suit to match with the Modern Race Suit Blue. You got moves bro? Add The Robot Legendary Emote to your repertoire. 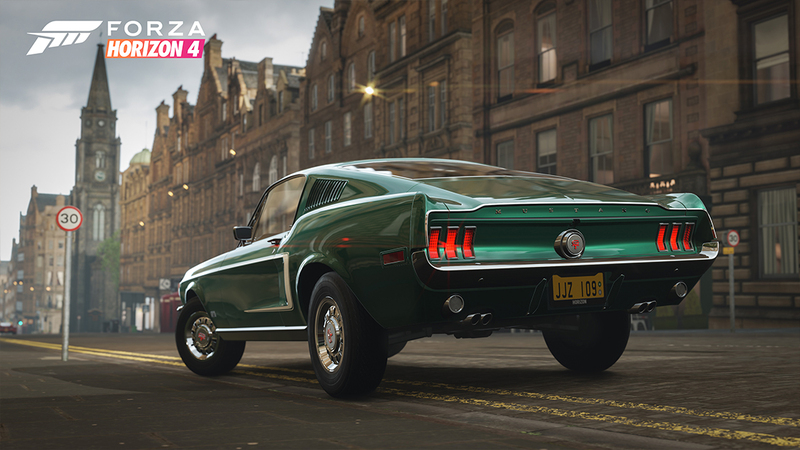 If you don’t know who Steve McQueen is or haven’t seen the movie Bullitt then now is your chance to up your historic car knowledge game, inspired by one of the most iconic pony cars, the 1968 Ford Mustang GT 2 + 2 Fastback. Feeling more mundane? 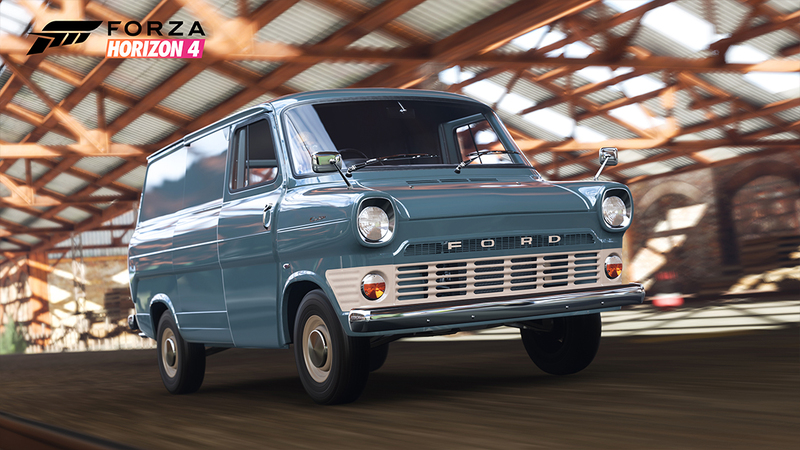 The Ford Transit Van is happy to serve practicality best and simply haul. Take a look at the details of these classics. There are few more memorable car chases in the history of Hollywood films than the unforgettable sequence in Bullitt, starring Steve McQueen. Under the hood of this baby is the same 390 V8 making about 325 hp that burned rubber around the streets of San Francisco. Which of course further ingrained McQueen, who loved to drive in his private life, as one of the great car driving heroes of the big screen. Movie screen fame aside, just consider the 2 + 2 Fastback itself, a car so desirable that you can still build one today provided you have a donor chassis. Just another pony car? Hardly. This is the car that helped make the Mustang the legend it is to this day. Practicality not excitement is the Ford Transit’s strength, but it does it so well and has hauled so many goods over the years it is much more than just an endearing mule. The Transit is a beloved workhorse that delivered everything from rubber duckies looking for the perfect bath to rock bands searching for stardom. Ask Scotland Yard and they will tell you that the Transit has been the culprit getaway vehicle in an astounding number of crimes, despite its inability to “getaway” with any significant quickness. It’s bland, and its functional down to its 73 horsepower V4 and live beam suspension, but sometimes getting the job done will earn you more credit than winning races. Next week the Series 6 cars are ready to rock. Get ready to race in the 1959 Cadillac Eldorado Biarritz Convertible, the 2018 TVR Griffith, or the 2001 TVR Tuscans S. Get your JDM on in the best of 1994 with the Honda Prelude Si, or the Fairlady Z Version S. Of course the radical 723 Quartz Regalia and its monstrous cousin the 723 Quartz Regalia Type-D will be making their way aboard as well.